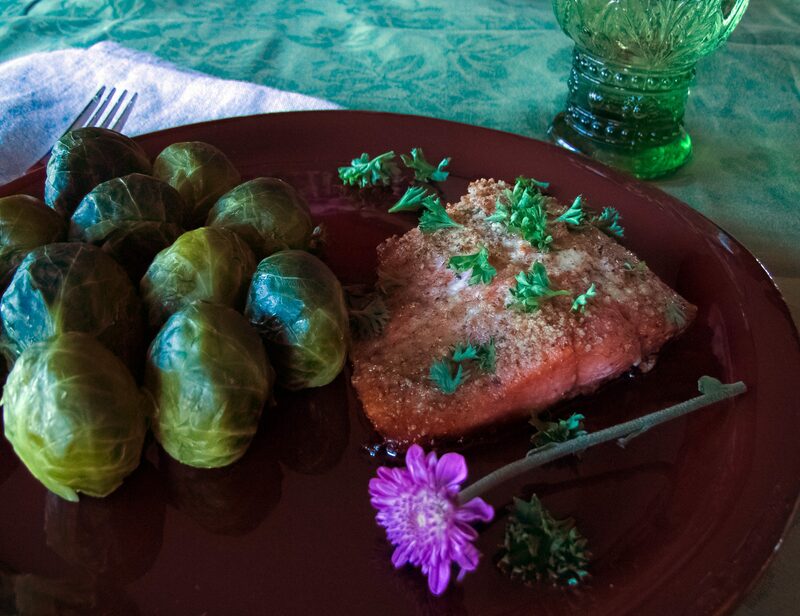 I love vinegar and I love salmon, so when I saw this recipe in my most recently-purchased cookbook, I knew I had to try it. My latest cookbook is The German Kitchen by Christopher and Catherine Knuth. It’s a lovely book written by a married couple who own and run a restaurant called Das Kaffeehaus. The photographs are beautiful, too, some depicting German scenery. Fortunately when we were there, white asparagus was in season, so I ate that as often as I saw it on the menu, always served with a delicious Hollandaise. I’ve always tried to learn the local language on a foreign visit, especially for the purpose of ordering food, so I quickly learned spargel mit schinken – asparagus with ham, plus the Hollandaise. A perfect lunch! In Germany, my husband quickly learned dunkel bier, which is German for dark beer – his favorite kind of beer. But I tended to the local Rieslings, and even was lucky enough to sample some eiswein, or ice wine. But back to this specific recipe, which is actually called Marinierte Lachssteaks in Rotweinessig. It’s simply salmon filets marinated in vinegar and oil, then broiled. Simple, but I’ve never seen a fish recipe like this so I had to try it! Combine the marinade in a bowl. 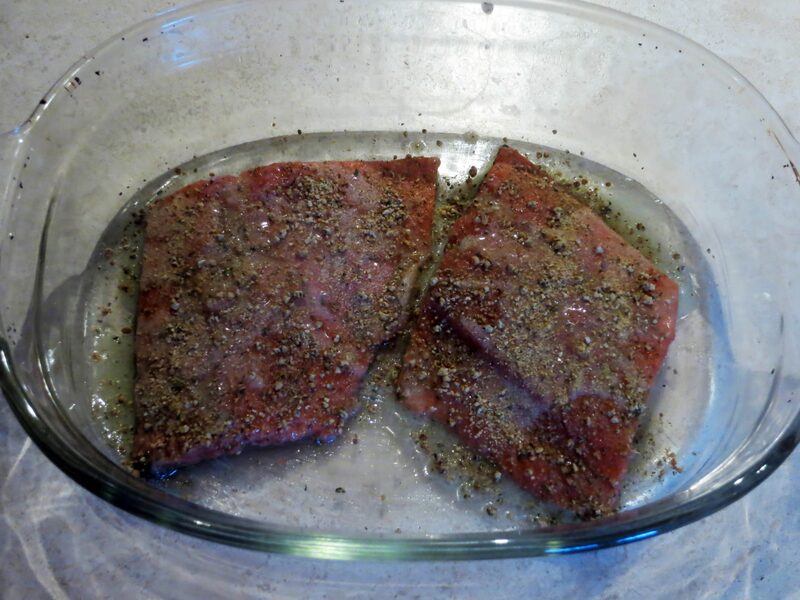 Place the salmon in the marinade, cover, and keep it in the marinade for approximately two hours. 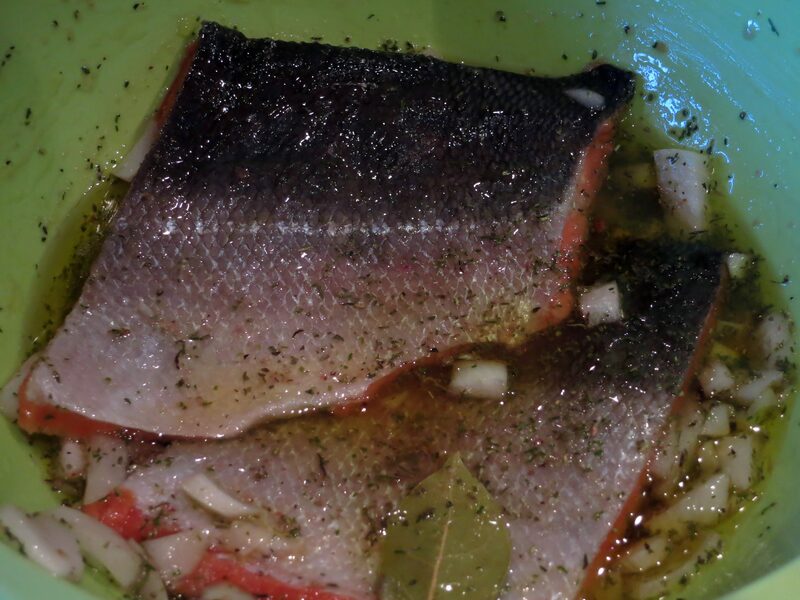 I was tempted to let the salmon marinate for longer, but I was afraid the vinegar would mush up the fish. Preheat the broiler. 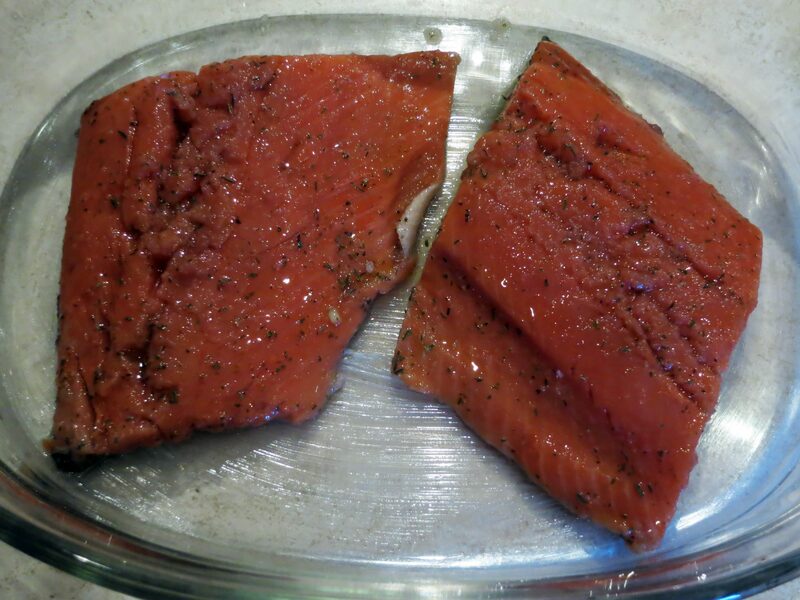 Remove the salmon from the marinade and place on a buttered baking tray. Brush with melted butter, sprinkle with the breadcrumbs, and season with salt and pepper. Place under the broiler for five minutes, until cooked. Garnish with parsley and serve. verdict: I probably won’t do this again. Somehow the vinegar and salmon didn’t quite go together for me, and unfortunately it was a waste of a marinade because it was fishy from the salmon, so I couldn’t figure out anything to do with it but pour it down the sink. But, there are plenty more enticing recipes in this cookbook! Ooh, this sounds so good! 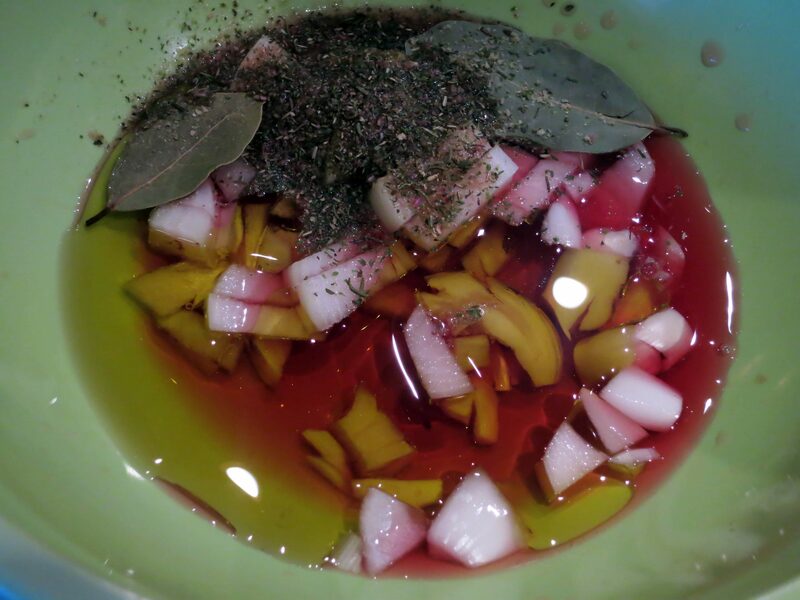 I’m a vinegar fan too– I have 4 kinds on hand right now, and I often make my own herb-infused vinegars. And salmon is my favorite fish, so I’m definitely trying this recipe! Thanks! your post brought me wonderful memories of a trip to Germany with my husband years ago – right in the middle of white asparagus season, and we had A TON OF IT, every meal… they do it in a superb way! Isn’t it amazing? I’m surprised I didn’t turn into a white asparagus!!! P.S. I’m thinking about your verdict on this; I still want to make it, but I might try a small quantity of balsamic vinegar instead. I wonder if the red wine vinegar is too light for such a rich fish? This is quite a dilemma for me because I love vinegar but this dish was just okay. This is a traditional dish, according to the book, and using balsamic would change it, which is fine, i just wanted to see what the german recipe tasted like. but I don’t think I’d marinate the salmon at all, just glaze the salmon instead with balsamic. Does that make sense?!! 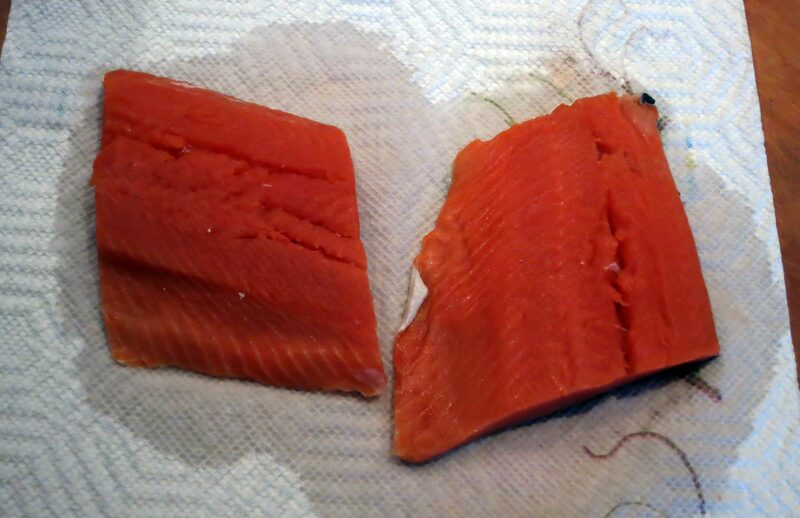 Sorry that salmon didn’t work out as you hoped but it’s good to hear of the recipes that aren’t always perfect. I tend to abandon mine and don’t right the up – but maybe I should sometimes! 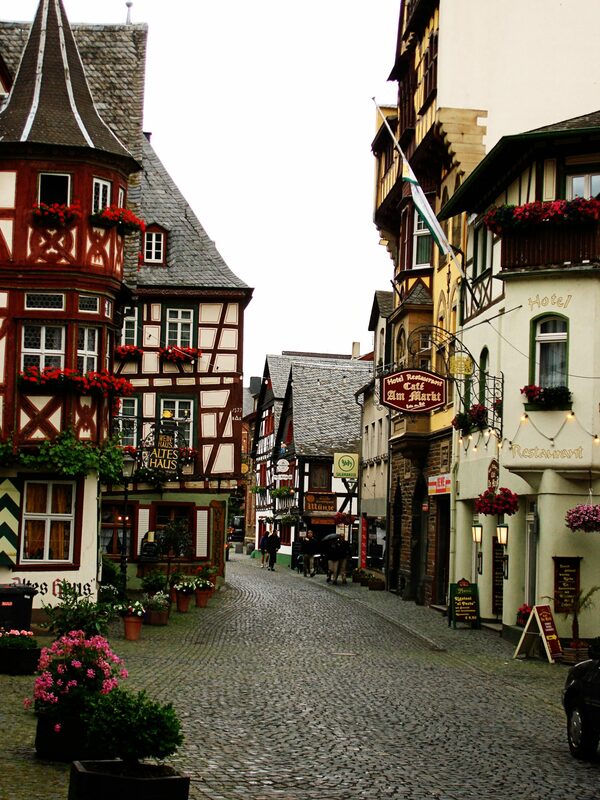 Love the photos of Germany. The castles in that part are amazing, aren’t they? 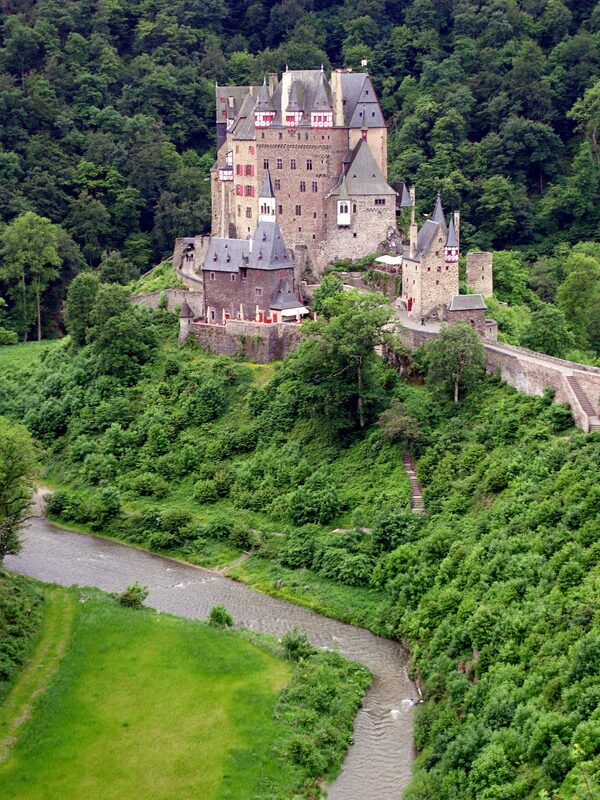 Fairy tale castles. I just don’t want this traditional recipe to give the cookbook a bad name, because there are many more lovely recipes in the book. I just wanted to try this one out, and it didn’t really work for me. Obviously a lot of Germans enjoy it! This is a good project for your James Beard award-winning chef wife! (I’m so impressed with that!). I really thought this would taste better….. I wondered about the vinegar. The marinade looks so good, I’m surprised the salmon didn’t taste amazing. I wonder if this marinade would be better with chicken. Then, it could marinade overnight. Hahaha! Chicken would definitely be better in this marinade. This tasted like there was vinegar poured over grilled salmon. It definitely had a bite, it just wasn’t fabulous!!! Hmmmm…the flavor profile seems right. I was surprised it required marinating for 2 hours. 100 ml of vinegar is enough acid that in 2 hours it will cook the salmon. Perhaps marinating it for less time might help. Also, the type of red wine vinegar might affect the flavor. I’m about to embark upon a vinegar making journey because I love red wine vinegars. I may give this recipe a try just to see. Not with the oil in it! That would keep the vinegar from cooking the salmon. Less time would help, probably, but then what’s the point?!! Please do make this recipe if you have time. I typed exactly as it is in the book! I tried to make red wine vinegar in a crock with a spigot but I never had any luck. Hope you have better luck. Maybe my house was too warm…. Funny using lemon which is so acidic with salmon is heavenly, interesting that the red wine vinegar was not great. Reminds me of a Caribbean dish I think it’s escovitch or something like that they use white flesh fish though.I often use balsamic as a glaze with capers and butter for salmon. The photo’s are beautiful, the book sounds wonderful too, I am sure that there are many wonderful recipes. Now I want some white asparagus with hollandaise. Hahaha! Isn’t that like ceviche? But you don’t marinate the salmon in lemon, right? I marinate the salmon in lemon zest and olive oil so it’s flavored with lemon and then squeeze lemon juice on the fish, Can you tell I love lemon on fish, LOL! Well, I love salmon any which way, so this looks delicious! Lovely photos of Germany! Even though it is close, I have hardly travelled there. I was a bit surprised at seeing red wine vinegar with salmon, so your verdict was not really a surprise. Thanks for sharing! German cuisine does not have a very good reputation, but you are right that they have good recipes too. The ‘spargel’ are also served like that in Holland by the way, and I have a recipe for white asparagus sous-vide with hollandaise sauce somewhere on my blog. Of course you do! I’ll check it out! Oh too bad it didn’t pan out because like you I love both vinegar and salmon and was quite excited about giving this a go. I wonder if a specific type of vinegar should have been used? Who knows. Thanks for posting this! Well, being that its a traditional recipe I guess this s the one you’re supposed to use, but maybe a white balsamic wouldn’t be as harsh? I love salmon in salads with vinaigrettes, which has the same major components as this dish, but it’s way better served that way to me than as this recipe….. Oh well! How lucky you are: Germany in asparagus season? Burg Elz? St. Goar? WOW. Not bad…I hope you tried a lot of wine, too! Ummmm hellooooo! You can bet I did!!! Mostly local Rieslings. Some off-dry, as they say. Nothing too sweet. They were fabulous! Awesome…I miss that a lot. I keep forgetting you’re German!!! What do you miss the most? The easy access to affordable great wine. That is really hard. That’s a very astute observation. I have such vivid memories from my time living in France picking the plums and cherries, and of the seasonal vegetables as well. In Oklahoma, you can’t get everything, so we’re not too spoiled! I was just at a whole foods in Utah, and I had so much fun in the produce section! We have a good farmers’ market, but what’s sold is what’s local. Oh well. So, I’m compelled to ask… what don’t you miss about living in Germany? But a Farmers Market is a good thing, right? Because it encourages us to shop seasonally. Absolutely! It’s just that here, there’s only corn and cantaloupe!! !